The New York Central's lakefront line through Cleveland hugged the south shore of Lake Erie and avoided most of the congestion of highly industrialized Cleveland. For that reason it was heavily used by through freights in both directions. Near the crossing of the Cuyahoga River it was also joined by the Pennsylvania, which entered town from the south via Aetna and Kinsman Yards and ultimately descended the escarpment to join the Central's lakefront line near Cleveland's stadium. 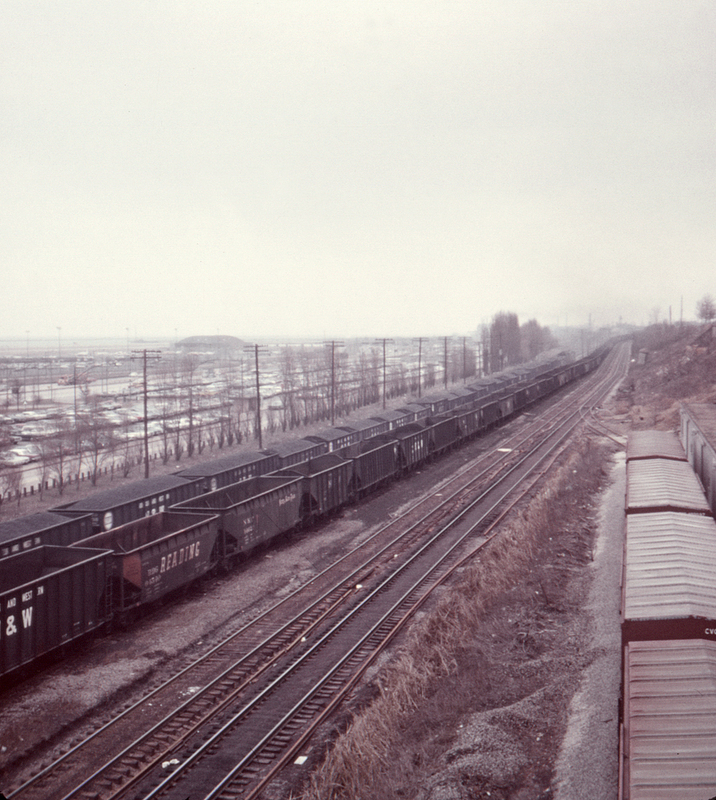 In this view from East 9th Street looking east, the Central's tracks are on the left and occupied by a loaded eastbound coal train while the Pennsylvania's rails have begun their stiff climb to the right away from the lakefront. Lugging loaded trains of ore from the Pennsylvania's Whiskey Island docks up this grade must have been a major endeavor. The Central's 25th Street Yard is just visible through the haze at the top of the Central's grade. The Pennsy maintained a small yard of its own just around the corner where the line turns to the right. At one time Cleveland's original union station was located here, just behind the photographer; when Cleveland Union Terminal was built the Pennsylvania chose to use their station at the top of this grade at East 55th Street as their Cleveland passenger terminal rather than pay the costs of using CUT. When Amtrak decided to restore passenger service to Cleveland, it built its own lakefront station near this location rather than pay for the necessary repairs to Cleveland Union Terminal, which today sees only trains of Cleveland's RTA Rapid Transit.